This is Elijah doing his job. Messing his toys is his duty. He never fails to do it. 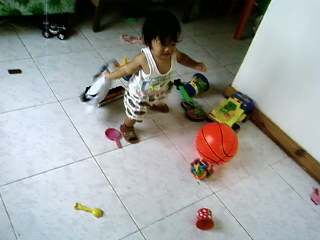 Whenever he see his toys at their proper places, he throws them everywhere until the basket is empty. Sometimes when he is in the mood, he puts everything back in the basket. But that will only happen once in a blue moon. Haha! what an active little boy you got there! welcome to mommy moments! my little boy is now 3 and he still throws everything on the floor. he fixes them only when someone helps him to fix… hay.. sometimes, i help him sometimes, i just leave it. anyway, hope our kids will learn to fix after themselves soon. So cute little guy. It reminds me of my son too. Your son is so cute. I have passed Mommy Moments this week. Having a messy house is a very commong thing when you have toddlers. I have two so, double the mess lol. Thanks for your visit Phebz, I am now following your blog..
hi!kids love throwing around small stuff hehe. You’ll enjoy mommy moments for sure! Thanks for dropping by my page. The little the kids are the little the trouble, so enjoy it pa 😀 happy weekend! a little boy making a big mess haha! nice post! welcome to mommy moments! LOL! Love your post! Welcome to mommy moments! Hello! Thanks for stopping by my blog. The giant’s house is in Dreamworld, Bangkok. If you happen to be in Thailand, its a worth place to visit. I hope Elijah will always be in the mood so you’ll have a little helper in the house. I think this is the best age to train him to pack up his toys at the end of his play. We’re having giveaway. Please come back and join the fun when you can. Thanks!